Turn your dorm room into a playful garden by adding this Anemones - Peel N Stick to your college dorm room decor supplies. This Anemones - Peel N Stick set comes with colorful flower pieces and stems so you can really "plant" a beautiful garden theme for your dorm room. Floral designs make cool dorm decorating ideas because they bring color and energy to small spaces. 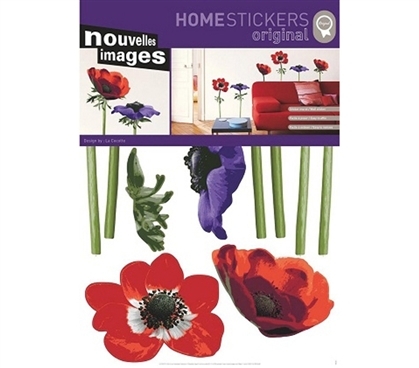 As a college essentials, this Anemones - Peel N Stick will turn your dull walls into a gorgeous mural of nature. Peel N' Stick dorm decor is a must have for any college student living in dorms. Peel N' Stick is special because it makes dorm decorating easier than ever. Peel N' Stick stickers don't leave any kind of mess or sticky residue on your dorm room walls. You can have fun placing your stickers in any way you like, and if you change your mind, then you can change your stickers! The Peel N' Stick stickers are totally re-positionable.